India’s AFOLU sector is an important sector for the economy as it provides direct employment to around 49% of the workforce. The estimation of GHG emissions and removals from the Agriculture, Forestry and Other Land Use (AFOLU) Sector includes CO2 emissions and removals resulting from Carbon stock changes in biomass, dead organic matter and mineral soils, for all managed lands; CO2 and non-CO2 emissions from fire on all managed land; N2O emissions from all managed soils; CO2 emissions associated with liming and urea application to managed soils; CH4 emissions from rice cultivation; CO2 and N2O emissions from cultivated organic soils; CH4 emission from livestock (enteric fermentation); and CH4 and N2O emissions from manure management systems. Despite providing direct employment to around half of India’s workforce, the contribution of the AFOLU sector to India’s overall emissions is fairly low. While in 2007 the AFOLU sector contributed around 12% of India’s overall GHG emissions, this had gradually dropped to around 8% by 2012. This trend can be expected to hold since energy and IPPU emissions are expected to continue to rise in absolute terms while emissions from the AFOLU sector can be expected to not change much and remain steady as the Indian economy diversifies and the Indian workforce moves away from the primary (agriculture) sector to the secondary and tertiary sectors. Despite this, however, there are mitigation opportunities that can be pursued in the AFOLU sector that could make an important contribution to the overall mitigation effort by India in pursuit of its Nationally Determined Contributions to the Paris Agreement. The graph below explains the emission estimates from these three sub-sectors. 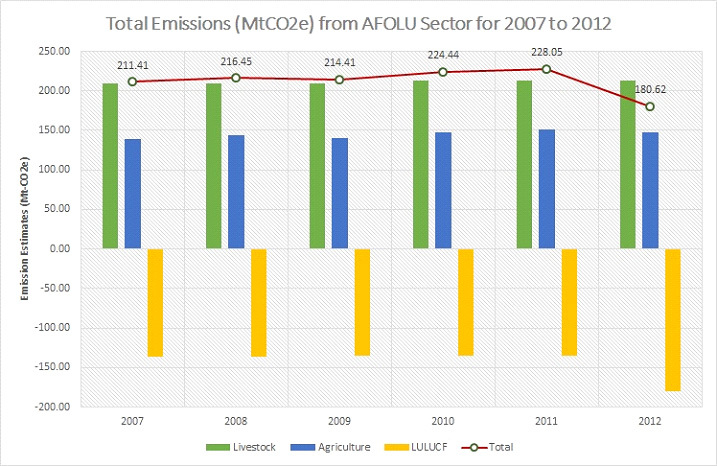 The livestock sector is the largest contributor from the AFOLU sector to the overall economy wide emissions in India ranging between 12% in 2007 to 9% in 2012. The Farm sector follows with emissions ranging between 8% in 2007 to 6% in 2012. The LULUCF sector is a sink for emissions and was absorbing around 8% of national emissions in 2012, the same proportion of emissions that was being absorbed in 2007, with a minor decline in the intervening years.